Read the article in The Record. Manomi De Silva, a recent graduate of Laurier’s Human Rights and Human Diversity (HRHD) program, is experiencing an internship opportunity of a lifetime, something she attributes to her undergraduate experience at Laurier’s Brantford campus. De Silva is working for the United Nations Office for Project Services (UNOPS), an operational division of the United Nations, which supports the implementation of its partners’ international peace-building, development, and humanitarian projects. 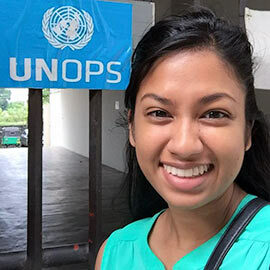 Situated at the UNOPS South Asian operational hub, De Silva is the unit’s partnerships and development communications intern, responsible for research and analysis of information relevant to the UN, as well as various communications-based projects. In addition to its appealing course offerings, De Silva found that the HRHD faculty members provided a truly meaningful and engaging undergraduate experience. With direction from her Laurier professors, De Silva is considering graduate studies at the Balsillie School for International Affairs, which offers academic programs on global governance, and international public policy through Laurier and the University of Waterloo. Laurier’s HRHD program is one that De Silva would highly recommend to students interested in studying law, international relations, or human rights. She attributes her early career success to the small class sizes within the program, and the faculty members’ obvious passion for student success. Laurier’s Human Rights and Human Diversity program offers students unique some learning options for their degree. HRHD students can earn a combined Bachelor of Arts in Human Rights and Human Diversity degree and Human Resources Management (with Conestoga College) or a combined law degree (LLB) from the University of Sussex, United Kingdom. For more information on the Human Rights and Human Diversity program at Laurier, please visit our programs page or contact Nicole Morgan, academic program assistant.